This is how you can beat the Great Shinobi Owl boss in Sekiro: Shadows Die Twice. 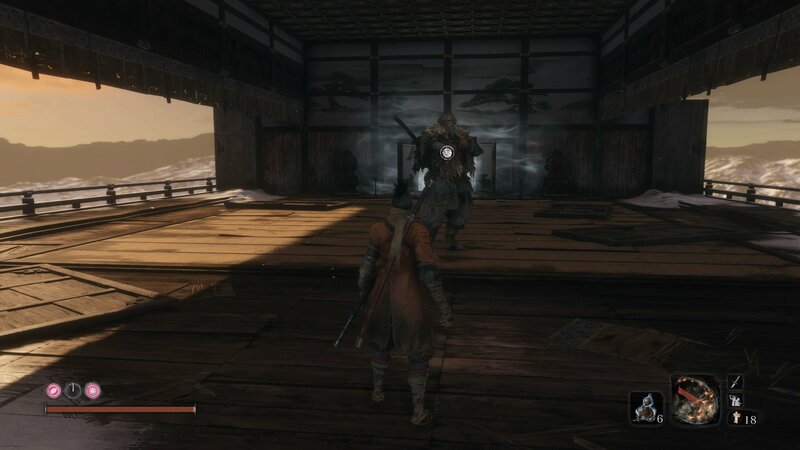 The Great Shinobi Owl might be one of the more intimidating fights of Sekiro, but it's actually not one of the difficult ones. In this Sekiro Owl boss guide, we'll be walking you through everything you should know about the boss, including how you can counter all of Owl's attacks. Firstly, we'll be walking you through some of the more essential tips that you need to know when facing off against Owl in Sekiro. The best attack to counter is when Owl flips through the air towards you. Sidestep the attack, and get in some easy hits. When Owl drops the health bomb, sidestep around him, and get in one quick hit. If you can recognise when Owl goes to kick you, and step back quickly, Owl will miss his attack and you can get in a quick few hits. Owl is prone to the Firecracker, but he can also let off a Firecracker attack of his own against you. You'll only face off against Owl if you pick certain dialogue options in Sekiro: Shadows Die Twice. Near the end of the game, Owl will appear at the top of Ashina Castle, and will ask Wolf to remember the Iron Code, and forsake Kuro. What you choose to say here is critical. Side with Owl and you'll face off against two bosses (one of which is Isshin Ashina), culminating in the 'bad' ending of the game. Reject Owl and stay loyal to Kuro for an extended end section of the game, which features multiple bosses and new areas. Before that though, you're going to have to go through Owl. A hulking mass of muscle standing at least eight foot tall, there's good reason to be intimidated by Owl. The trick to this battle, though, is not being scared off by his huge presence, and going toe to toe with him whenever you can. This fight is going to be a lot of dodging, and chipping away at Owl's health with single attacks. Owl has a limited number of attacks in phase one. The attack you're trying to bait is the one where he throws two shuriken at you in a row, before leaping into the air, slamming into the ground where you stood. Your goal here is to move out of the way while he's in the air, and stab him with a quick few attacks when he lands. Another attack that you can take advantage of is the one where Owl kicks your sword. If you can step back at just the right time during this, Owl will kick thin air, and you're free to land a single attack before backing off to safety. If Owl pauses and reaches into his pocket, he's about to throw a special bomb at you. This explosive, while not damaging, will temporarily restrict your ability to use healing items like the Healing Gourd and Pellets. If you simply sidestep this attack to the right, you can get in a good two hits on Owl before he has a chance to change animations. Since Owl's a Shinobi like Wolf, he has some tools up his sleeve. He wields an amplified version of the Firecracker, which spreads out a wall of explosives in front of him. Whenever you see black dust in the air ahead of you, jump or step backwards immediately. The aim of this fight is to really get the attack patterns of Owl down so that your deflections are on point. There are attacks where you're really better off standing your ground, like the one where Owl rushes forward with a sweeping attack on his left. In the second phase of the fight, Owl's undergone a bit of an upgrade. This time, whereas he would previously rebound off you into the air and throw shurikens down on you, he'll now throw blotches of poison, which cover areas of the arena for right around 10 seconds. Either avoid them, or bring some Antidote Powder with you. It might be a good idea to employ the Firecracker Prosthetic during this stage of the fight. The Firecracker is great for stopping Owl in his tracks, which gives you precious seconds to heal or lay into him with a brief few attacks. Additionally, we'd also recommend the Whirlwind Slash Combat Art. This is excellent for situations where you dodge Owl's anti-healing bomb, for example, as it allows you to get in several hits, as well as Posture damage, in a very short space of time. Once the fight against Owl, the Great Shinobi is all done and dusted, you're firmly into the end portion of Sekiro. 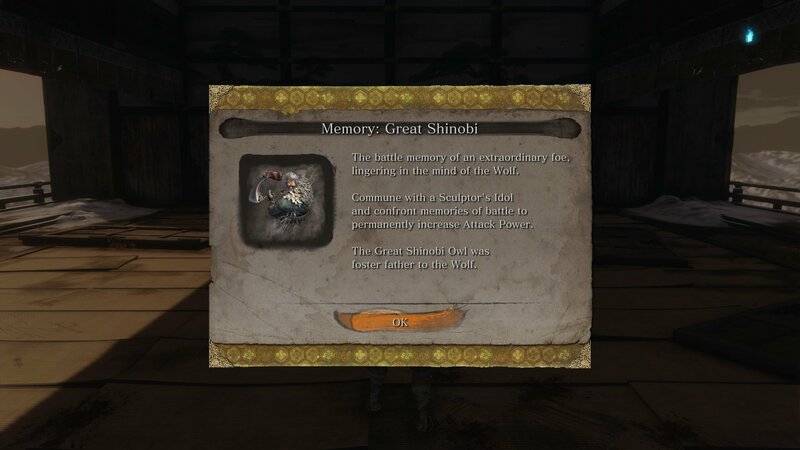 You'll get the Memory: Great Shinobi for your efforts, which increases your attack power. If you really want to make the fight against the Great Shinobi Owl as easy as possible, then look no further than the video below. Besides spamming the Firecracker on the boss, you can trap him in right next to the door which Kuro previously went through, repeatedly attacking him and not allowing him to use any abilities for a quick fight.